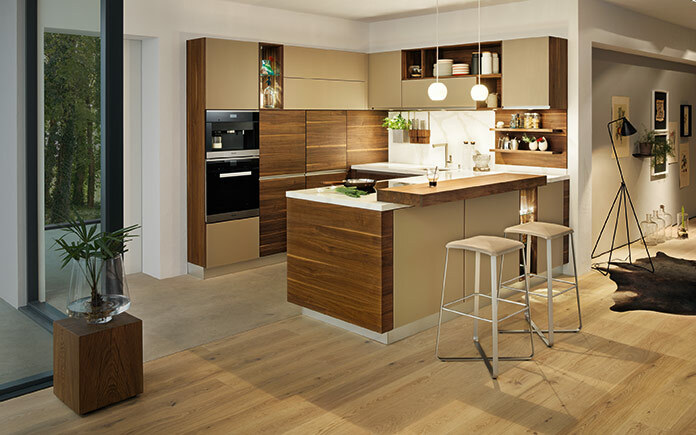 The TEAM 7 linee kitchen has a modern and urban feel. Cubed forms, generous surfaces and clear lines combine to create an exceptional air of elegance. 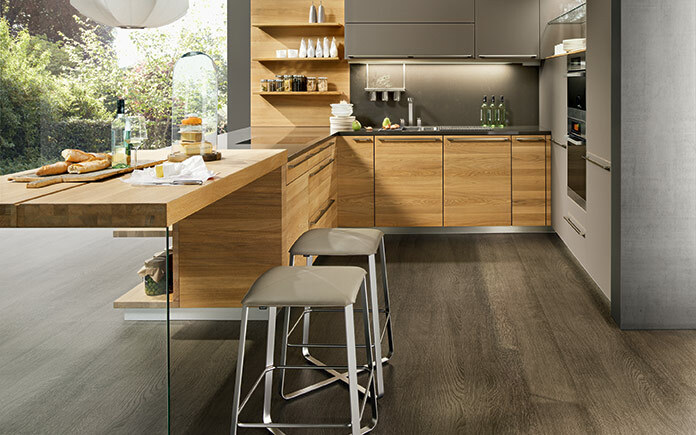 The minimalist design perfectly incorporates the personalities of the seven different types of wood available. 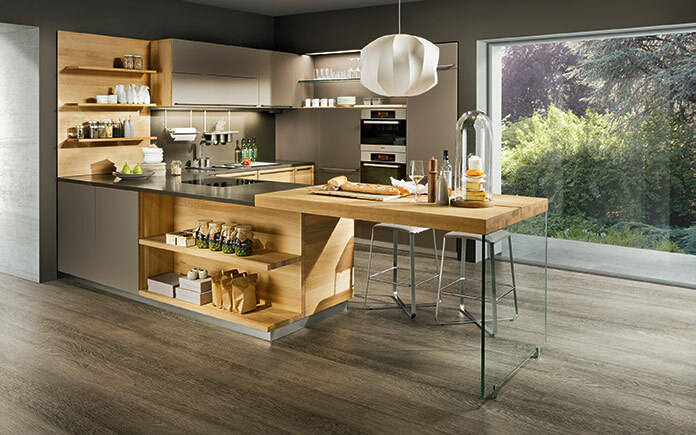 The successful mix of natural wood, stainless steel and coloured glass evokes a feeling of modern airiness and an atmosphere of comfort. The extensive range of products and flexible design options are what make this best selling TEAM 7 kitchen really stand out. 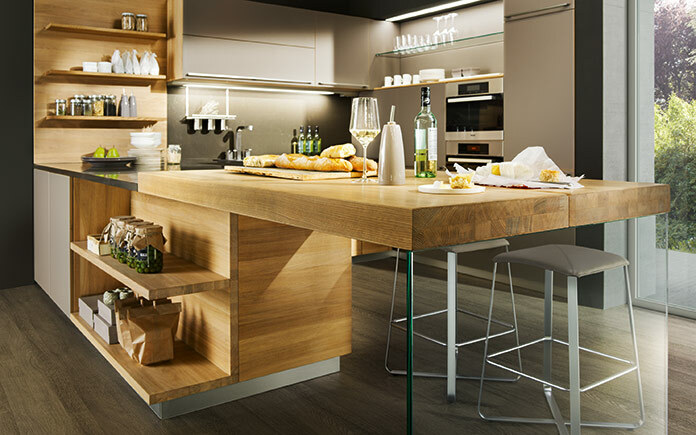 Whether you want a straightforward row of units or a kitchen island for cooking, you can configure linee however you like. 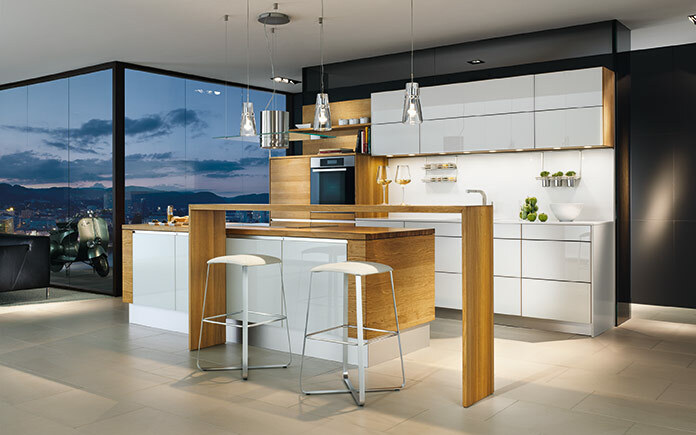 As a result, perfect solutions can be devised to suit any requirements and any living space, even if you are searching for small kitchen design ideas. A novelty is the exciting possibility to cover the entire sides of the body with coloured glass. This heightens the clean, puristic look from the outside, while the body which is now entirely constructed from solid laminated timber, evokes the pleasure of sensual natural wood, every time it is opened. For the fronts TEAM 7 uses high-quality, warp-free triple-layer panels manufactured at the company’s own panel factory. Also the interior of each linee kitchen unit certainly lives up to the outside with its top quality and hand- crafted intricate details. 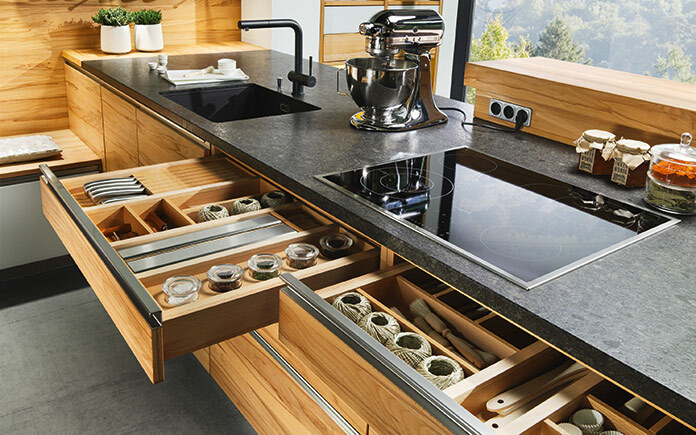 Handy accessories such as individual wooden drawer compartments, pull-out racks and carousel units with Le Mans swivel fittings, plus non-slip shelves characterise the sophisticated interior design and make this kitchen ideal for everyday use. 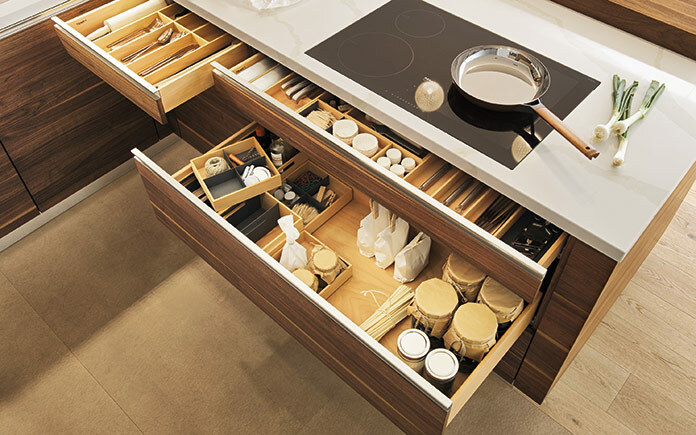 For additional convenience, drawers and wall unit doors can be equipped with an electrical opening and closing function. 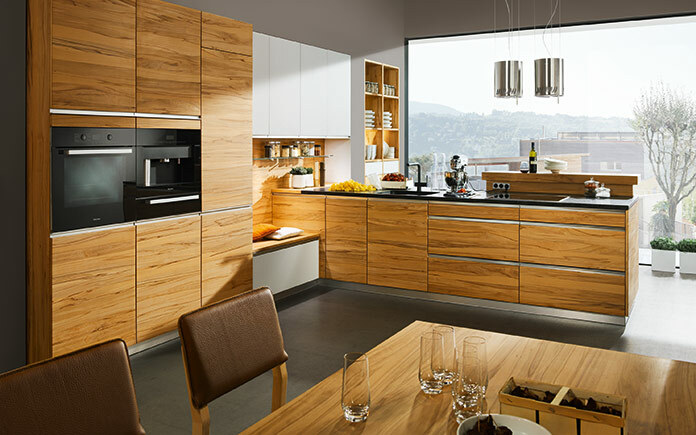 You can perfect the individual look and feel of your linee kitchen by choosing a suitable handle design. From the flush-mounted handle strip through to the modern stainless steel hand rail that emphasises the puristic design, there are all kinds of creative options available. 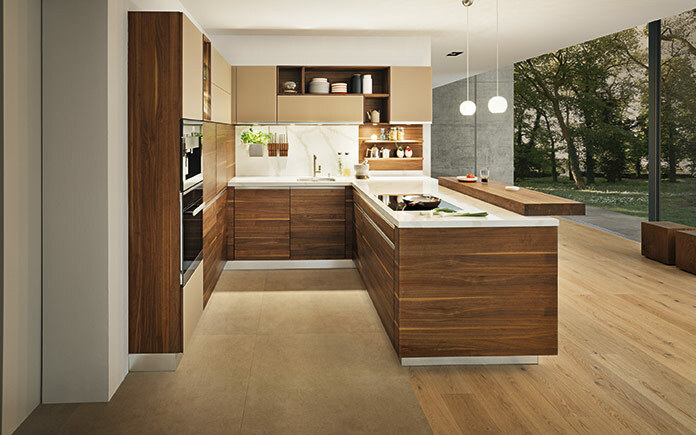 Innovative technology encompassed in a contemporary minimalist style creates a sense of well-being. 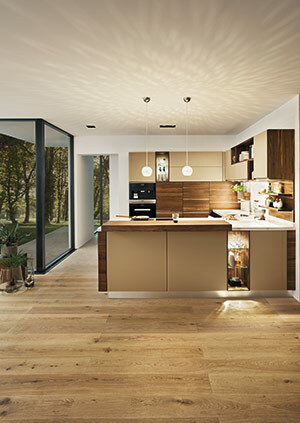 With its attractive price structure and versatile range of layout options, linee is the perfect all-round kitchen.